After weeks of media speculation, the seemingly inevitable departure of Francesco Guidolin finally arrived today as the Swans sacked the Italian on his 61st birthday and replaced him with former United States national coach Bob Bradley. 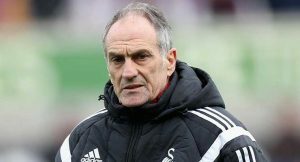 Sadly the writing appeared on the wall for the amicable Guidolin after a poor start to the season and his position was probably further undermined due to public spats with both Neil Taylor and Ki Sung Yueng, which fuelled talk of the Italian losing the dressing room. You could probably argue that given the recent fixture list, which included games against Chelsea, Manchester City (twice) and Liverpool, that the Italian should have had more time to put matters right, but it appears as though the club’s new American owners and in particular Huw Jenkins had lost faith in the man he gave a two year contract to in May 2016. The dismissal of Guidolin isn’t the issue here though, for a club run the way Swansea City has during the last 13 years, it was the manner in which the dismissal was handled that leaves a bad taste. The local and national media have been touting the lead candidates for the job openly, despite Guidolin still being in office. Ryan Giggs seemed the bookies favourite and is rumoured to have even been interviewed by Jenkins on the evening of the Manchester City EFL Cup game. Consequently, Guidolin’s future was widely talked about on social media, as was highlighted by the Premier League Social Index, with the Italian leading the way with many fans predicting that he’d be the first Premier League manager to lose his job. Whilst it is prudent of the club hierarchy to prepare and plan for a change in management, it is both un-professional and foolish to broadcast such matters to the media. Did the club need to share this information with the media or is there a mole in the camp supplying the PR machine with the requisite facts for pre-empting a change in management. Of course it gets worse than that. The Swansea City Supporters’ Trust, who still have a 21% stake in the club and a director on the club board, weren’t even consulted about the change in management. Is that really the way to handle the managerial appointment for a football club. This behaviour and the whole way the situation was handled, isn’t what we’ve become accustomed to with our football club and it most certainly isn’t the Swansea Way. What is done is now done, but we’d like to say thanks for everything Francesco but most of all thank you for being professional, humble and honest when those around you weren’t.